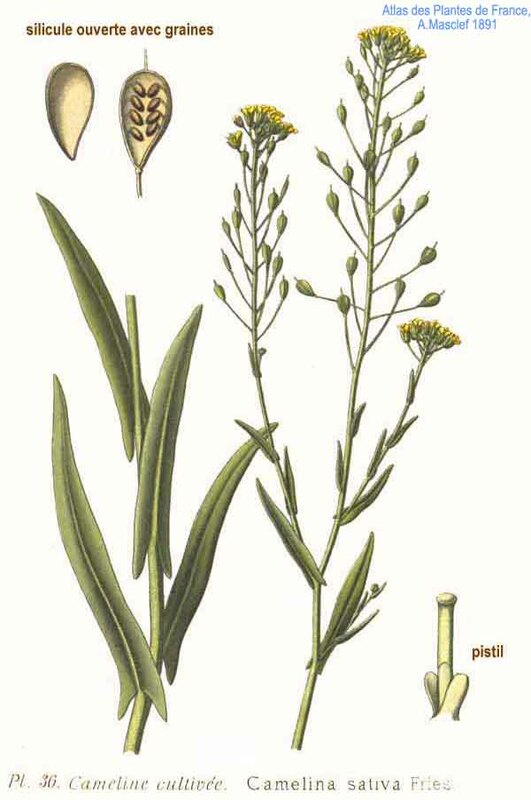 Camelina sativa is an annual or winter annual, to 70 cm tall, stems erect, branched above, smooth to slightly fine-hairy. Leaves of basal rosette narrowly spatula-shaped, base tapered to a stalk, stem leaves lance-shaped, clasping stem, base lobed. Flowers yellow, petals 4, small. Fruit dry, capsule oval, to 0.9 cm long, 0.7 cm wide, widest above middle, tipped by persistent stigma, stalk to 2 cm long, seeds yellowish. Habitat: Open waste areas, roadsides. Notes: A crop plant. Oil from seeds used to make soap. Recent increased interest in the oil as a health food (Wikipedia 2006).